I purchased a new dog carrier and on the tag, it states “free storage bag when you register online.” Where do I register? Please click here to register your bag. What size carrier do I need for my dog and cat? 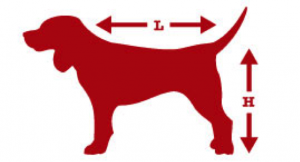 For the appropriate fit, you must measure your pet, nape to base of tail and nape to floor. Your pet should have enough room to enter the carrier and turn around comfortably. Please measure carefully; pet carriers, pet beds and pet toys are non-returnable by sanitation laws. Are there regulations about taking my pet with me when I travel? Can I bring my dog on a plane in a Bark n Bag carrier? Bark-n-Bag carriers are airline approved. All airlines have different requirements for your Jet Set Pet. For up-to-date information check the website: bringfido.com/travel. I have a Bark-n-Bag tote for my dog, can I take him/her on a plane in the tote? Totes are not airline approved. They were designed as a fashionable functional accessory for transporting your pet around town. For airline approved transportation, please view our selection of carriers. When ordering pet carriers or pet totes make sure to properly measure your pet prior to order. Pet carriers cannot be returned for sanitary reasons, please measure your pet or contact us to confirm a proper fit prior to ordering.